It's O S C A R - you know the song. Buggy is quite the picky eater as I'm sure many toddlers are. But she is really, really a picky one. Every day is a struggle to figure out what I'm going to feed this kid. When she was a baby she refused to eat Stage 3 foods. She would not eat anything with chunks in it so we stuck with stages 1 & 2 and that worked for her. We are still dealing with that today. She loves chicken nuggets but won't eat chicken. Every time I give her something new to try she picks it up and puts it to the side. I know it takes about 10 or so tries before they will eat something new so we are still trying. 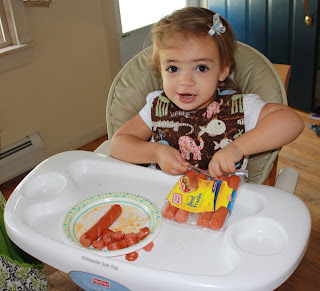 These days she is into hot dogs - all it took was one time. I generally wouldn't feed them to her but they are now made with no fillers and especially no by-products so they are healthier than they used to be. Even I started picking at hers when she's not looking - LOL! I am also trying to get Buggy to eat more veggies. I must admit that I still feed her baby food but its generally when I don't cook and really stuck on what to give her. But at least she is getting her veggies. I'm still nursing her so I'm wondering if that may have something to do with it. Do any of you have picky toddlers? Feel free to post some of their favorite foods in the comment section. Hopefully I can get some more ideas from you guys.